On February 23, 2009, Richard Sewing, 79, was involved in a vehicle collision that claimed his life. Mr. Sewing was currently serving on the National Wild Horse & Burro Advisory Board as the Humane Advocacy Representative as well as being the heart of the National Mustang Association. While I did not know Mr. Sewing personally and know I am not qualified to write a fitting memorial, what I did know of him urges me to say THANK YOU for all his dedication and compassion for working tirelessly to protect America’s mustangs and burros. I first learned of Mr. Sewing and the National Mustang Association through BLM’s Battle Mountain WH&B Specialist Shawna Richardson. She referred me to Mr. Sewing due to one of the many projects he was involved in, which included financing and installing solar pumps at suitable well locations so wild horses and burros could continue to drink during long summer months. Later, I ran into Mr. Sewing’s work again through a grazing allotment BLM had authorized that was, for all practical purposes, a wild horse sanctuary for adopted mustangs overseen by Mr. Sewing himself. As far as I know, this is the one and only authorization of its kind on public lands done solely for the benefit of adopted mustangs. While I may not know everything wonderful to be said about Mr. Sewing and for that I am truly regretful, it seems to me that he had dedicated his life for many years through generous commitments in both time and money to the preservation and protection of wild horses and burros on the range. From his work, I would also venture to say he had a unique ability to both understand the system and tried to work within it to find alternative solutions and partnerships for “on the range management” of America’s mustangs and burros whenever possible. Also Click Here to see "Local Activist Dies in Car Crash" for more information. Photo of Colorado Sand Wash Herd Management Area round up October 2008. Used with permission. Courtesy of Carol Walker – Living Images. Founded in 1954, the Humane Society of the United States (HSUS) has grown to be the largest, richest and most powerful animal rights organization in the world. Looking into HSUS’s track record, it turns out there are three main bones of contention repeatedly fired at them over the years, the first being a subtle change in their mission statements in 1980 from an animal welfare organization to an animal rights organization. The second bone is accusations of misleading the public through deceptive advertising and fundraising ploys. Despite photos of adorable or tragic animals splashing the pages of their “Donate Now” campaigns, some point out their website has a buried disclaimer affirming it is a completely independent organization not affiliated in any manner with local animal shelters, humane societies or organizations. The third bone of contention and perhaps the biggest, is the manner in which they juggle their mega-monetary funding. One of the big concerns is, no single board provides consolidated oversight of the “Humane Nation” empire, thus potentially allowing the networks under their control to hide and misrepresent where and how funds are distributed. By the way, if those Katrina accusations are true, this wouldn’t be the first time HSUS has employed the strategy of absorbing those who either criticize or compete with them. Since these mergers, active participation and legal challenges regarding management and treatment of wild horses and burros or their habitat loss have all but disappeared - despite HSUS’s formation of a new Animal Protection Litigation Section in 2005. Instead, the sole focus has become promoting fertility control via PZP, which HSUS holds the exclusive patent too and has spent decades investing in. While declines in wild horse and burro populations or habitat loss seem of little concern to HSUS these days, the concern for other species and their habitat loss is definitely becoming a main priority in the HSUS network. One of HSUS’s affiliate organizations established in 1993, the Wildlife Land Trust, touts their involvement in the protection and enhancement of more than 1.8 million acres of wildlife habitat in 37 states and seven foreign countries since its inception. (13) However, it too has come under fire. As for charity watchdog groups, according to one source, HSUS and its affiliates have received embarrassingly low scores, which included a score of zero for the Wildlife Land Trust itself. It’s interesting to note that recently, the Wildlife Land Trust has just entered into a new collaborative effort called Wildlife Land Trust Australia in order to protect the unique species of the Australian ecosystems. Coincidentally, Australia is also home to the largest “feral” herds of horses and donkeys in the world. In 2007, HSUS spent over $11.8 million dollars on Wildlife Programs alone. Perhaps this would explain their conflicting embraces of Ted Williams and other anti-horse and burro supporters as was evidenced in “Wayne’s Blog” on May 30, 2007. Click Here to read how President Wayne Pacell addresses wild horse activists Julianne French’s protests of HSUS’s support of Mr. William’s because of such statements as calling those who support wild horses and burros the “wild horse mafia”. However, if you chose to point out the flaws in Mr. Pacells arguments, don’t hold your breath waiting for your comments to be published as HSUS is very clear they only publish a “sampling” of opinions - despite Wayne’s arguments on how it’s good to “embrace diversity”. This would also explain why HSUS works side by side with organizations like the Sierra Club, such as in the recent lawsuit challenging the Bush administrations new rules that gut public disclosure and rolls back threatened and endangered species protections. (15) For those of you unfamiliar with the Sierra Club’s three decade “direct reduction policy”, they actively support killing via firearms if no other “humane outlet” can be found to dispose of them. Click Here to view. At that time, HSUS had just received a grant worth over $1.7 million dollars from the Annenberg Foundation to implement “Assateague of the West: Protecting Wild Horses Through Immunocontraception”. (17) Common sense suggests challenging the Sheldon proposal would have been counterproductive to government partnership programs needed to continue entrenching PZP in future wild horse and burro management. Coincidentally, the letter also requested HSUS provide follow up on the results of fertility control experiments conducted on the herds since at least 1996 as BLM stated there were high incidences of club-foot in this restricted military area with no historical records citing this as a problem before. Apparently, the new funding didn’t cover checking back on HSUS’s “old” experiments…. It may also explain why, in September 2007, when 185 wild horses were dying at BLM’s Palomino Valley Wild Horse and Burro Holding Center due to one of the worst cases of mismanagement ever recorded, HSUS didn’t bother protesting, challenging or asking BLM for accountability because they were busy negotiating with BLM for places and herds to conduct their new experiments on. Heidi now works side by side with BLM personnel as a “humane representative” for HSUS and is responsible for monitoring the Sand Wash and Cedar Mountain wild horses herds HSUS gave the thumbs up for BLM to round up this past fall - despite knowing the captured “excess” wild horses are now at serious risk of facing slaughter or execution. To learn more about the Jackson Mountains story and Heidi’s extensive involvement in it, Click Here. 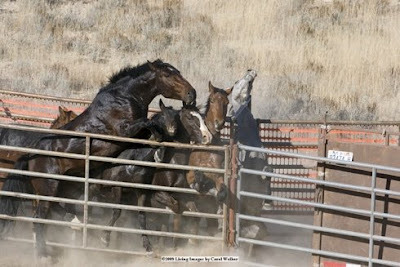 Maybe being a former BLM employee explains why Heidi or HSUS expressed no concerns about how the contractors at the Sand Wash round up funneled way too many wild horses much too fast down the chutes, causing them to dogpile over each other as shown above leading to the trampling of a mare that professional wildlife photographer Carol Walker caught on film. To view extensive photos of the Sand Wash round up and what happened, Click Here. Perhaps this also explains why, though Heidi was directly at the capture site, she didn’t see a need to protest or stop the round up as the contractor drove them straight into trailers and instead, counseled Ms. Walker about how advocates must be “pragmatic” regarding BLM’s management of wild horses and how only PZP will save them. To learn more about the Sand Wash round up, see American Wild Horse Preservation Campaign’s “Colorado 2008 – Government Contractor Exposed – Part 2" by Clicking Here. And learning all this has also caused me to wonder…. How could HSUS get grant money and continue to promote their exclusive patent on PZP if, after BLMs relentless round ups over the last eight years, the wild populations still remaining on the range are really much lower than BLM keeps telling everyone they are? It would kind of take the wind out of the $1.7 million dollars sails, future grant monies or lifetime contracts for PZP use, both here and in Australia, wouldn’t it? And maybe, that’s why Allen Rutberg and everyone else at HSUS doesn’t want to do follow up in the Nevada Wild Horse Range or look at Ginger Kathrens complaints and the proof she says she has about what has been occurring in the Pryor Mountains wild horse herds. Or maybe, as someone recently suggested, the truth of the matter is, PZP really does work but only if it’s given at the right time. Except BLM and HSUS know they can’t always administer it on every herd at the “perfect time” due to BLMs vigorous year-long round up schedules, so losing a few foals in the winter is better than losing them all to slaughter houses, right? Since HSUS won’t give the time of day to what Ginger Kathren’s says she’s found out about PZP, I will ~ See below. So why is it HSUS seems disinterested and/or is not legally challenging BLMs “other” management of our wild horse and burro herds or last summers announcement of considering execution or slaughter for all those now on death row as a result of this “other management”? Let me go back and read this all again…. Click Here for comments on PZP and Pryor Mountain herds. Click Here for BLM’s Report on PZP results. (21) BLM wild horse Herd Management Areas submitted to HSUS for consideration of fertility control experiments provided courtesy of Dean Bolstad, BLM National Program Office, Wild Horse and Burro Lead, Personal Communication 11/20/08.